Welcome to highwood. Welcome to relaxation. The clean lines of the highwood Weatherly Collection are inherent in this Backless Bench. Choose from 4 feet or 5 feet widths and a variety of colors sure to complement your piece of paradise. The relaxed, yet bold styling makes a statement without overwhelming the environment. 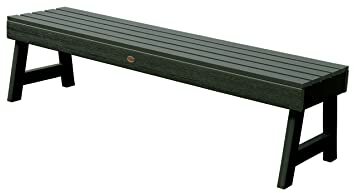 Bench features a contoured seat for full-scale comfort. Explore the entire highwood product line to coordinate other beautiful and durable products that enhance your outdoor living space. Best of all, our material doesnt absorb moisture and repels dirt and grime, making clean-up a breeze. This product has been load tested, per ASTM 1561-03 (2008) standard for Outdoor plastic furniture, and has a 500 pound weight capacity. Some assembly is required (see assembly guide). Welcome to highwood. Welcome to relaxation. The clean lines of the highwood Weatherly Collection are inherent in this Garden Bench. Choose from 4 feet or 5 feet widths and a variety of colors sure to complement your piece of paradise. The relaxed, yet bold styling makes a statement without overwhelming the environment. 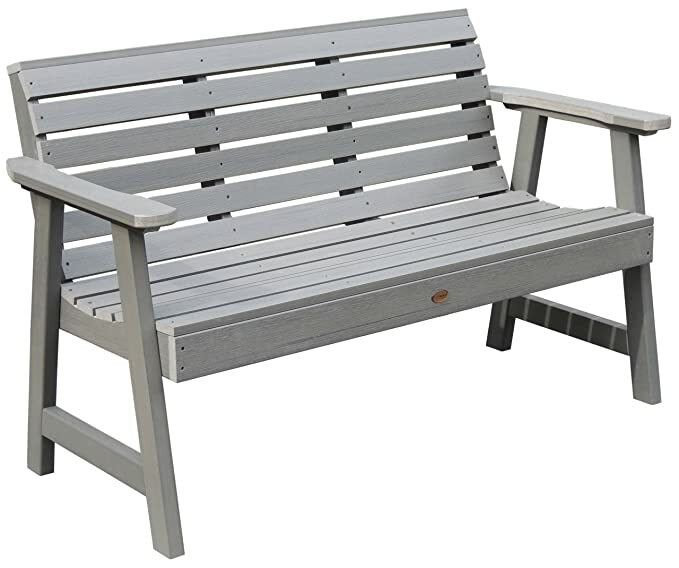 The Garden Bench features a contoured seat for full-scale comfort. Throw in your favorite decorative pillows and a cozy blanket for an evening gazing at the stars. Explore the entire highwood product line to coordinate other beautiful and durable products that enhance your outdoor living space. Best of all, our material doesn’t absorb moisture and repels dirt and grime, making clean-up a breeze. 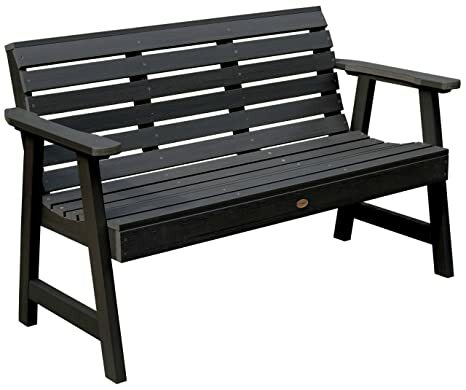 This product has been load tested, per ASTM 1561-03 (2008) standard for Outdoor plastic furniture, and has a 500 pound weight capacity. Some assembly is required (see assembly guide). Welcome to highwood. Welcome to relaxation. 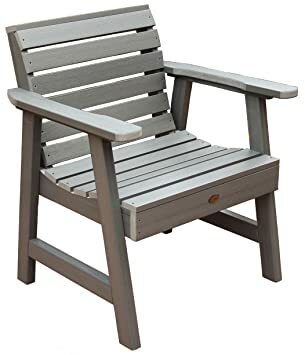 This highwood Rocking Chair has all the distinctive, clean design elements that the Weatherly Collection is known for. Find yourself comfortably cradled and lulled into a peaceful, tranquil state. The smooth, gentle rock of the chair gives new meaning to the expression, rock on. Explore the entire highwood product line to coordinate other beautiful and durable products that enhance your outdoor living space. Best of all, our material doesnt absorb moisture and repels dirt and grime, making clean-up a breeze. The rocking chair has been load tested, per ASTM 1561-03 (2008) standard for Outdoor plastic furniture, and has a 500 pound weight capacity. Some assembly is required (see assembly guide). Welcome to highwood. Welcome to relaxation. 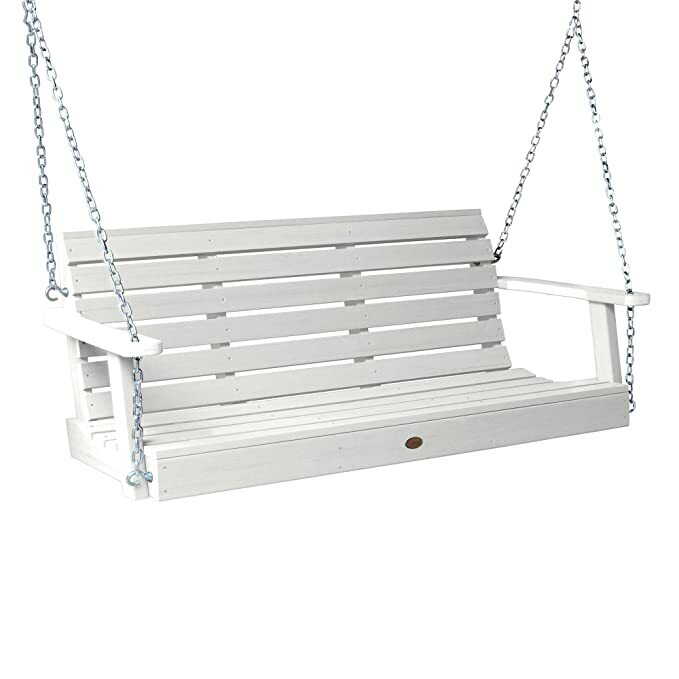 The clean lines of the highwood Weatherly Collection are inherent in this Porch Swing. Choose from 4 feet or 5 feet widths and a variety of colors sure to complement your piece of paradise. Throw in your favorite decorative pillows and a cozy blanket for an evening gazing at the stars. Explore the entire highwood product line to coordinate other beautiful and durable products that enhance your outdoor living space. Best of all, our material doesn’t absorb moisture and repels dirt and grime, making clean-up a breeze. A free zinc-plated steel chain is supplied so it is “ready to hang” to a sturdy structure (please use strong hooks – not provided – to hang the chain from and support the weight of the loaded swing). Extra lengths of chain are available on request for a small fee if required. The swing has been load tested, per ASTM 1561-03 (2008) standard for Outdoor plastic furniture, and has a 500 pound weight capacity. Some assembly is required (see assembly guide). Welcome to highwood. Welcome to relaxation. 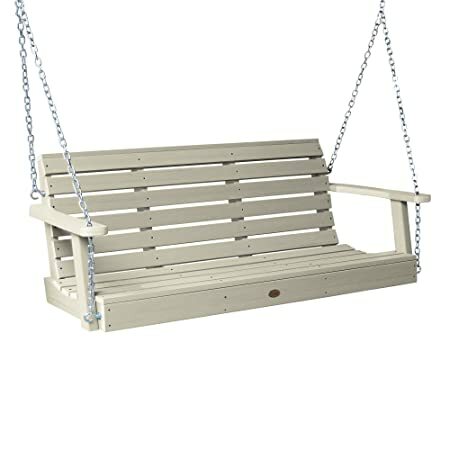 The clean lines of the highwood Weatherly Collection are inherent in this Porch Swing. Choose from 4 feet or 5 feet widths and a variety of colors sure to complement your piece of paradise. Throw in your favorite decorative pillows and a cozy blanket for an evening gazing at the stars. Explore the entire highwood product line to coordinate other beautiful and durable products that enhance your outdoor living space. Best of all, our material doesnt absorb moisture and repels dirt and grime, making clean-up a breeze. A free zinc-plated steel chain is supplied so it is ready to hang to a sturdy structure (please use strong hooks not provided to hang the chain from and support the weight of the loaded swing). Extra lengths of chain are available on request for a small fee if required. 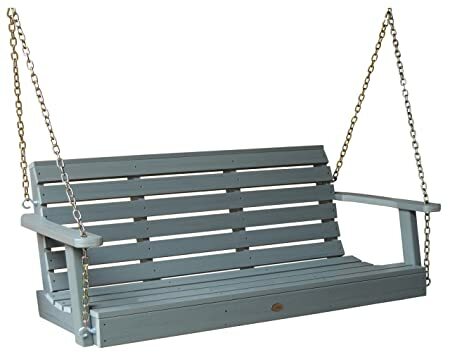 The swing has been load tested, per ASTM 1561-03 (2008) standard for Outdoor plastic furniture, and has a 500 pound weight capacity. Some assembly is required (see assembly guide). Welcome to highwood. Welcome to relaxation. 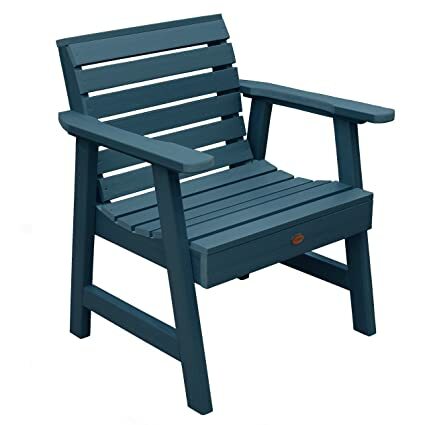 This highwood Garden Chair has all the clean lines that the Weatherly Collection is known for. The relaxed, yet bold styling makes a statement without overwhelming the environment. Adorn the chair with your favorite outdoor pillow or seasonal accoutrements like a pumpkin, scarecrow, statue, or snowman. Explore the entire highwood product line to coordinate other beautiful and durable products that enhance your outdoor living space. Best of all, our material doesn’t absorb moisture and repels dirt and grime, making clean-up a breeze. 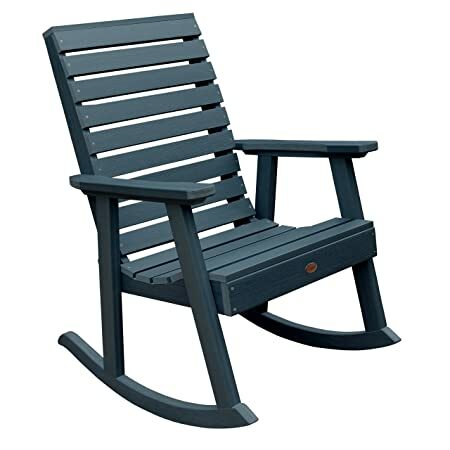 This product has been load tested, per ASTM 1561-03 (2008) standard for Outdoor plastic furniture, and has a 500 pound weight capacity. Some assembly is required (see assembly guide).